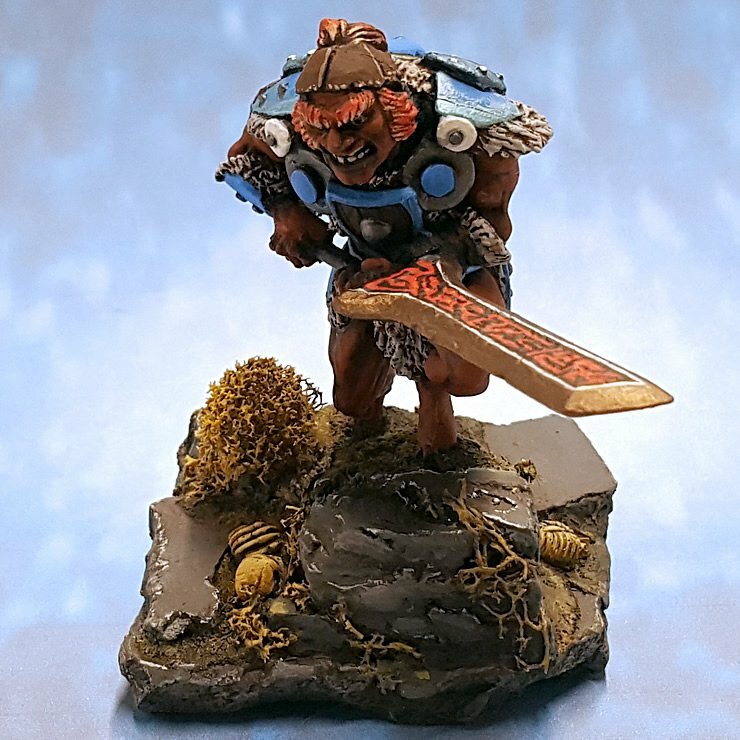 This 25mm scale Fire Giant isn’t humongous by today’s miniature line standards but he has a lot of character. The sculptors, Chaz Elliot and then apprentice, Jason Wiebe, put a lot of great detail into this fellow. I personally love the knowing grin on his face. However, partly because of the scale and the sculpted position of the giant, I felt he wasn’t set up right. So he was reposed a smidge. When I first looked him over at the work table, I held him on a slab of slate and tried to visualize him on a game board. It’s fairly obvious that he was originally meant to be looking down at the puny humans before him but against the more prolific 28-32mm scale miniatures I own, he was looking at their chests or groins. So after playing around with slate pieces such, I finally figure him out. He needed his sword level. Well his arms were tight to his chest so repositioning the weapon that way would require practically resculpting him. But … if I cut apart the integral base and and changed the elevation of his feet he looked like he was slinking up some stairs. Thus the step and repose. You can check out his painting WIP 1 & WIP 2. The repositioning and base construction was done a long time ago before I was doing WIP posts.